Adepticon is great for many things. The greatest thing I get from Adepticon is inspiration and motivation. I ran into an old friend at Adepticon and while we didn't get as much time to hang out as I had hoped, we did talk a bit. He has wandered away from WFB into the lands of warmachine and is enjoying himself but misses the crew back on the other side of the fence. He recently threw a gauntlet in my face and tossed me a challenge. Paint a new 1K army between now and Adepticon. Should be easy right? Well, it should but we both have numerous distractions in life (Diablo III is gonna swallow my soul for a while). 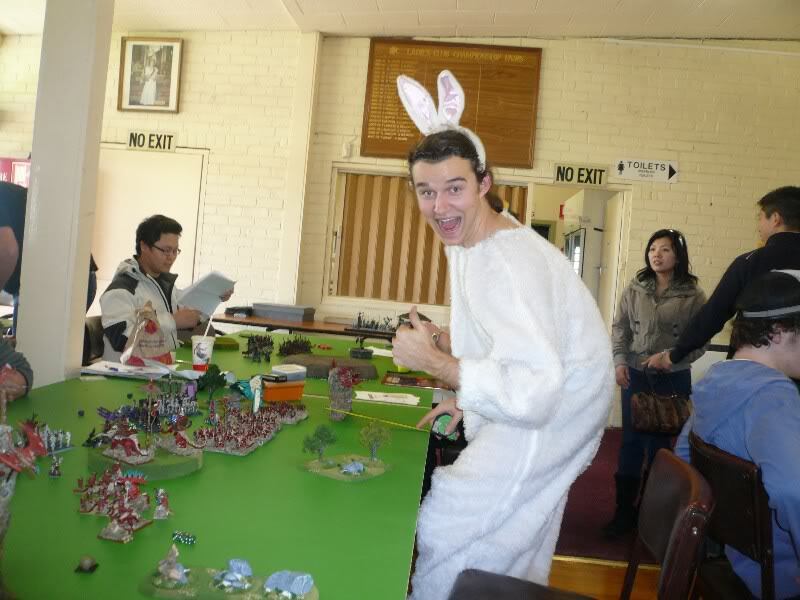 Not to mention that I also want to paint a new 2.5k ish army for Waaaghpaca / next year this year. And a new TT army with Caius (who I may have also convinced to come back to the fold). We decided upon a wager. If you don't paint the 1K army within the years timeframe then a terrible fate would bestow you. 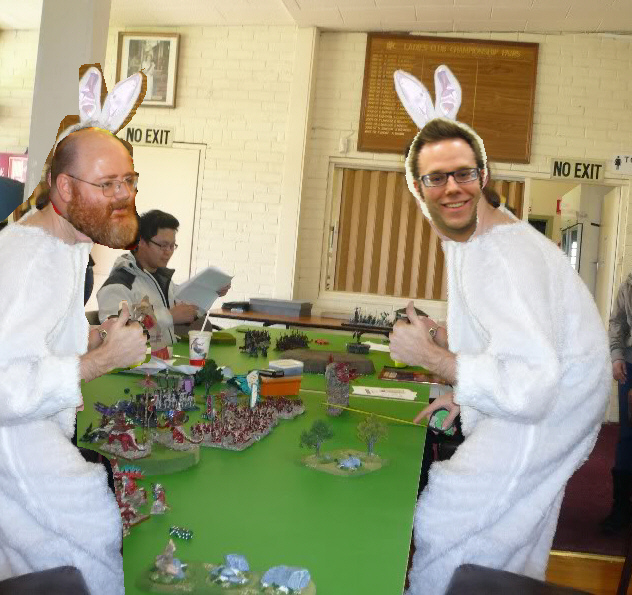 Inspired by a pic I saw from a friend / previous editor (Bobo the Vampire Monkey or Isaac Alexander of Unseen Lerker fame) I decided the loser would spend 1 ENTIRE day of Adepticon in a bunny suit. The challenger agreed and now we are off. Bobo sporting his lovely bunny suit. This is a great idea. Even I might get something done if there were such a challenge on the table! I am stoked to follow the progress. I'll throw down on this. What is the due date? Adepticon 2013?